Card counting systems are well-known worldwide for the efficiency and accuracy they provide players with. As they require a lot of efforts and knowledge, their main users are experienced gamblers who realise how beneficial they can be if applied correctly. Throughout the years, they grew in popularity very fast due to the huge edge players were able to gain thanks to them. The reason why the card counting systems are so effective is that they give them the opportunity to derive valuable information from the cards and therefore, make wiser decisions about their bets and moves. This way their chances of winning are significantly increased and even though the casino has a built-in advantage, players can turn the tables in their favour and achieve the desired result. All card counting systems aim at the same – to provide players with the needed information which will help them make better decisions and therefore, win. However, the main difference between them is to what extent they manage to do so, providing that they are applied correctly. 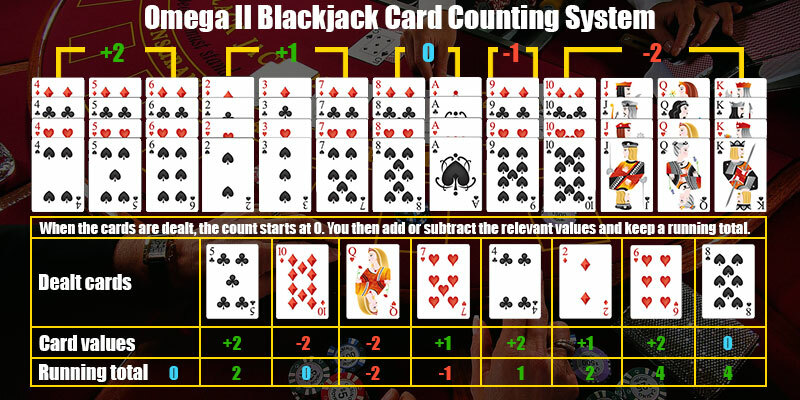 This is the reason why one of the most used card counting systems in Blackjack is Omega II as this system gives players an extremely high level of efficiency and accuracy during the course of the game. Omega II card counting system drew the attention of many players when the successful book Blackjack for Blood was published in 2001. Its author Bryce Carlson is a famous professional player whose book was an inspiration to many gamblers. His main aim was to show via it that the concept that the casinos cannot be beaten is wrong. He proved that with an effective strategy, knowledge and discipline everything is possible, even in the gambling world. Blackjack for Blood is very easy to understand and it is recommended for both inexperienced and experienced players as it includes the basics of the game but at the same time it explains their subtleties which are more advanced. This book will remain in the history as one of the most valuable Blackjack works ever written. Card counting systems are divided into two categories, depending on their level of difficulty and the number of their final count. The Omega II is level two which means that it is more complicated to be comprehended in comparison to the Hi-Lo system or the K-O system. However, players need to take into account the fact that it is also more effective and accurate as its betting efficiency is nearly 99%. This can be a huge advantage for them if they manage to apply the system correctly in the casino setting. Another classification that is worth mentioning is that this system is a balanced one which means that players need to make the conversion from the running count into the true count in order to get more accurate information about the cards in the deck. In general, unbalanced card counting systems are considered to be harder to use than the balance ones due to this specific conversion which many players struggle to conduct. This is the reason why Omega II system is recommended for gamblers who have already mastered the basic card counting systems and know the principles behind them. The Omega II system uses the fundamental principle of assigning different point values of the cards however the plan of this strategy makes the count more complicated, if compared to the rest of the systems. In order to manage to use it in the casino, players need to be prepared to dedicate a lot of time to it. This system is not the easiest one, but it is worth mentioning that if they manage to understand it and apply it when needed, it really pays off. The assigned values in this system are as follows: the cards two, three and seven are counted as plus one, four, five and six get plus two, eight and ace get zero, nine is counted as minus one and ten as minus two. It is noticeable that the counting in this system is much more diverse and complicated as it involves more than the three standard assigned values of minus, plus one and zero. Players should take their time to carefully learn them and observe the system’s subtleties, if they want to manage to take advantage of it. One the one hand, this system gives players significantly high chances of determining their position at any point in the game. Knowing whether they are in an advantageous situation or not is extremely valuable as this way, they can adjust the basic strategy and their bets accordingly. Thanks to this information, they will be able to make wiser decisions and increase their chances of winning in the long term. This system is especially designed to work in favour of the players by helping them keep track of the cards more successfully. On the other hand, one thing that can be considered as a drawback of Omega II is its complicated plan and when we add on top the fact that it is also an unbalanced system, it becomes one of the most challenging card counting systems. This is the reason why it is really important to take into consideration whether or not they will be able to apply it in casinos as most of them offer a lot of distractions .Without high level of concentration players won’t be able to take advantage of it and can only get confused in the whole counting process which might result in money losses. Even though Omega II is considered to be one of the most complicated ones, players should take into account the fact that it gives them better chances of gaining advantage over the casino and winning. In general, the harder one card counting system is, the better. This system has proven to be worth learning as it provides a very high level of accuracy and efficiency. It is predominantly used by professional gamblers who are willing to invest a lot of time and efforts in order to manage to apply it when needed. This is the only way they can take advantage of it as its complicated plan of assigned values requires this kind of dedication.